The xWatch is an explosion-proof surveillance camera which provides a color image with high resolution which can be viewed in real time and allows the pre/post event analysis. It is specially designed for areas which are remote and hard to access, or which present high risk environment. Several configurations of this system are available. They include a stand-alone camera which acts to perform the standard closed circuit TV (CCTV) functions. 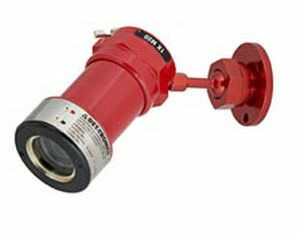 a camera attached to the Det-Tronics X-series flame detector via the adapter fitted at the factory or a camera fitted into the current system to upgrade it to a comprehensive gas and fire safety system.